13 ½” X 19” serigraph print--historic design & color. 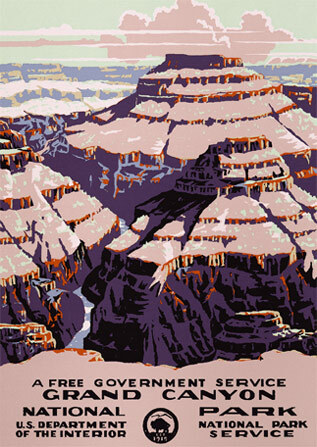 Grand Canyon is perhaps the most complex design of all the historic posters. 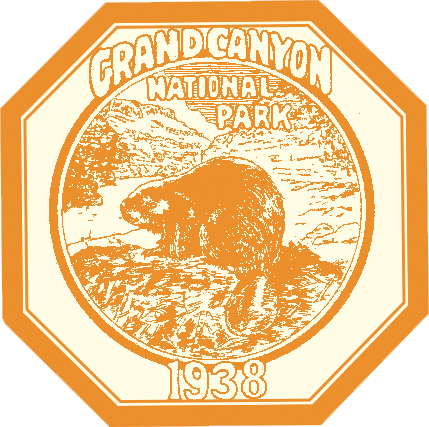 Missing is the "Ranger Naturalist Service" banner which is replaced with: "A Free Government Service" located below the design. I've visited the location of each poster and this stumped me and even the park rangers at first. Quite by coincidence, I discovered the WPA artists made their sketches from Moran Point....and later added buttes to correct for composition. It was both the river and the distant cliff features that gave this location away. Only four original copies are known to exist: two in the park collectionsl, one at the Library of Congress and one in a private collection.